Knowing what to stock up on and what you can store in the fridge guarantees you can always fix up something delicious (and affordable) in just minutes. Here are the essentials I always keep on hand. Frozen vegetables and fruit are super convenient and ensure you can have your favorites all year. They’re prewashed, pre-chopped, and pre-packaged! I always have frozen broccoli, carrots, corn, green beans, peas, and spinach on hand. Frozen strawberries, blueberries, mango chunks, and peaches also come in handy for quick breakfast smoothies and muffins. Frozen shrimp can be kept for up to 2 months and are a great staple for fast weeknight cooking. The best way to thaw shrimp is to let them sit overnight in the fridge. But if you’re in a rush, you can place the shrimp in a colander and run them under cold water for about 10 minutes. Chicken breasts can be stored in the freezer for about 6 months. Wrap them and repack in freezer bags instead of leaving them in the store packaging. Thaw frozen chicken overnight in the refrigerator. Ground beef is another freezer-friendly staple. Buy in bulk, but freeze it in small portions so you can thaw it more quickly when you need it. Greek yogurt is one of my go-to ingredients. It is an amazing substitute for many high-fat ingredients like mayonnaise, sour cream, or cream cheese. And often you can’t taste the difference. I promise! Dried pasta will last on your shelf for a couple of years. I reach for spaghetti, fettucine, linguine, and macaroni again and again, even to make some of my Asian-inspired dishes. Canned black beans, kidney beans, corn, and crushed and diced tomatoes are very versatile. Stock up when they’re on sale. Dijon mustard, honey, rice wine vinegar, white wine vinegar, reduced-sodium soy sauce, and Sriracha are my pantry essentials. Quinoa and rice (both white and brown) play supporting roles in many of my meals. Dried vs. Fresh Herbs Yes, fresh herbs are great, but unless you’re making something like pesto that absolutely requires fresh basil leaves, you can always use dried herbs. Just keep this ratio in mind: fresh herbs to dry is 3:1. I recommend purchasing organic apples, pears, strawberries, peaches, sweet bell peppers, celery, spinach, lettuce, potatoes, and carrots, to name a few, as they are the most susceptible to pesticide residue. I also always suggest using freshly grated Parmesan cheese above anything else. There is a noticeable taste difference between fresh Parmesan and the kind that comes in the green can. When you cook grains, make a large batch. As you’ll notice in the book, I often use leftover rice or quinoa. Cooked rice and grains can keep in the refrigerator for a few days or frozen for a couple of months. You can use cold quinoa the next day in breakfast bowls, or use leftover rice in Kimchi Fried Rice, Beef and Broccoli Bowls, or California Roll Bowls. You should also make extra of the sauces, salad dressings, soups, smoothies, and dips in this book to give yourself a headstart on prepping other meals throughout the week. 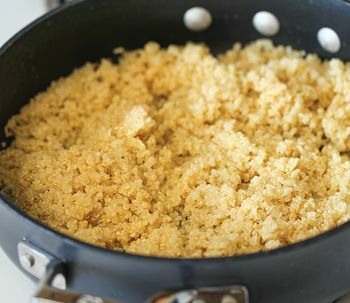 Cooking perfectly delicate and fluffy quinoa is actually quite easy: All you need is a ratio of 1 cup uncooked quinoa to 2 cups liquid—it can be water, chicken broth, or vegetable broth—it’s up to you. Let it come to boil, reduce heat to low, cover, and simmer until the liquid has been absorbed, about 20 minutes. Fluff with a fork. But the most important thing to remember is to thoroughly rinse the quinoa before cooking using a fine mesh strainer—this will help remove any bitterness. CAN I COOK IT IN A SLOW COOKER? Damn Delicious readers always love a good slow cooker recipe, so I included an entire chapter devoted to that. Here are just a few tips to make sure you get good results: Although there are a range of slow cooker sizes, I find that the 5- to 6-quart slow cooker is the best for my recipes. Fill it up only ⅔ of the way. Your slow cooker shouldn’t be overcrowded. To prevent any food-safety issues, be sure all meats and vegetables are fully thawed before adding them to your slow cooker. If time permits, I recommend browning your meat before adding it to the cooker. Yes, it’s an extra step, but it adds a layer of rich caramelized goodness. (And don’t forget the browned bits in the pan—they’re absolute gold.) Add dairy products in at the very end of cooking to avoid curdling. And as a general rule of thumb, the low setting will cook twice as long as the high setting. 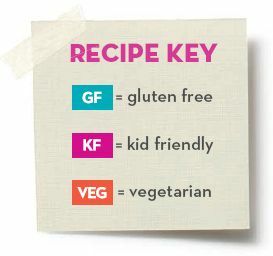 However, temperature settings can vary with different models, so make notes on what works for yours and adjust your cook time if necessary. 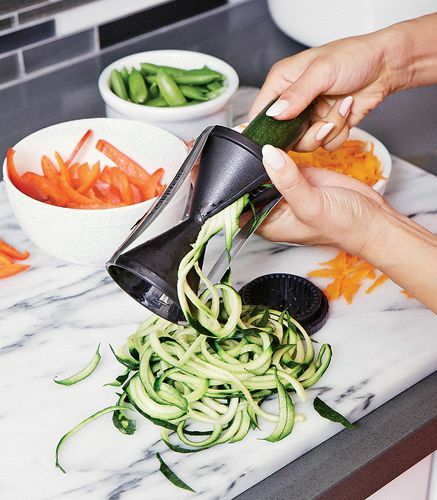 WHAT IS A SPIRAL VEGETABLE SLICER OR SPIRALIZER? A spiralizer is a hand-operated kitchen tool or machine that creates vegetable “noodles” in seconds. It’s an affordable investment that’s a simple and easy way to sneak in extra veggies or add a new texture to pastas and salads. You can use it with many fruits and vegetables, including cucumbers, carrots, zucchini, and even apples. I use it in several recipes like the Zucchini Lo Mein and Zucchini Salad with Roasted Tomatoes and Mozzarella.